Item number is "DCC100",For a love as true as time, give her this stunning ring by TransGems F Colorless Moissanite eternity band. Fashionable and sleek in 14k white gold, this band is perfectly lined with glittering, glistening gems. This elegant ring is the perfect gift for your wedding day, anniversary, or any time you want to display your eternal love for her. Center stone is 0.1ct（3mm）,total about 2.0ct-2.5CTW (according to the ring size).Round Cut Genuine Transgems Moissanite in 14K gold. 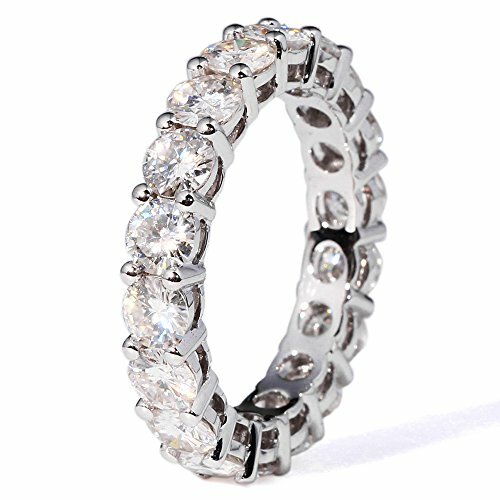 Transgems as a seller with years of production of moissanite,Our moissanite more white than the other seller (After careful selection).In order to enhance Sense of weight of the ring on purpose. Lifetime Warranty and Certificate of Authenticity included, shipping in DHL.